From jewelry and organic clothing to toys and vintage home décor, we are dedicated to bringing you American-made products of beauty and quality that are also safe, natural and non-toxic. It’s always a joy to discover new websites featuring sustainable products. Lila Mae has a breadth of choices perfect for natural gift-giving. that are all made in the USA. We are thrilled to introduce you to some of our favorite American innovators whose vision and passion for what they do is reflected in their original approach to cutting edge style. From jewelry and organic clothing to toys and vintage home décor, we are dedicated to bringing you American-made products of beauty and quality that are also safe, natural and non-toxic. Happily, we don’t have to sacrifice the environment or our health to create a thriving economy, and we don’t have to sacrifice our sense of style to fill our lives with safe and sustainable treasures being created right here at home. From Mother’s Day to Natural Baby Gifts, there are lots of green gift options. We were sent a Root Studio Mama and Baby Owl set. What a Hoot! This whimsical pair of owl friends are both cuddly and sustainable. A Lila Mae exclusive, our mama and baby owl are hand-sewn with 100% organic cotton fabric and naturally dyed wool felt. They are stuffed with organic kapok fiber fill. The delightful pair sport one patterned fabric on the front and a coordinating print on the back. A felted heart on the tush makes these already huggable stuffed animals irresistible. Just the right gift for a newborn, the baby owl tucks nicely into a crib. 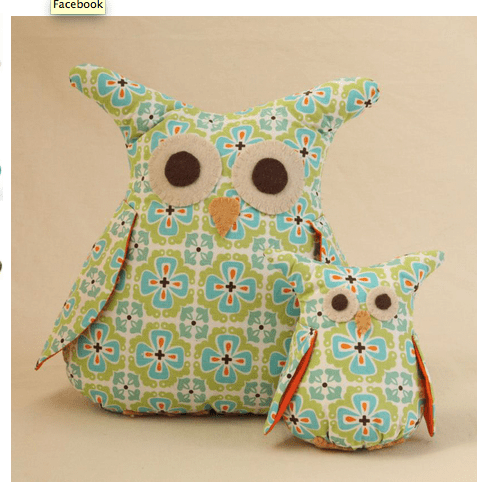 The mama owl is a great gift her on her own, or together with her baby. Symbolizing wisdom and foresight, these eco-fantastic friends are a perfect addition to your child’s room or play space. Details: Kapok is a mass of silky fibers harvested from the ceiba tree. It is naturally hypo-allergenic. I really like the variety of items offered by Lila Mae. It is a unique collection, and you can trust they have selected only quality, sustainable products made in the USA. « Are your kids shoes toxic?